Synthetic lubricant for V-3 superchargers. 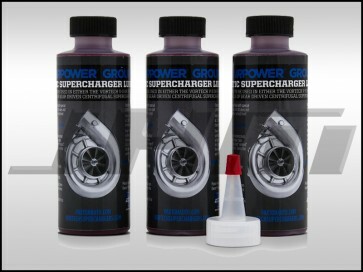 This special fluid is required for proper maintenance of the V-3 supercharger. Use of any other fluid will void the warranty and may cause component failure. Ensure that the .06" copper sealing washer is located on the dipstick base. Thread the clean dipstick into the unit until it seats. Once the dipstick has seated, remove the dipstick from the unit. Fluid should register in the crosshatched area on the dipstick. DO NOT OVERFILL!! Drain excess fluid from the unit if it is above the maximum level on the dipstick. Check the supercharger fluid level using the dipstick at least every 2,500 miles. Initial supercharger fluid change must be performed at 2,500 miles. The supercharger fluid must then be changed at least every 7,500 miles. Drain the fluid, re-fill the unit only with 4 oz. of Vortech supplied lubricating fluid. Confirm proper oil level using the dipstick. DO NOT OVERFILL! !